As Travis notes in his post on the upcoming election for Chapel Hill Town Council, the filing period to run for the Chapel Hill Carrboro City Schools Board of Education also begins on July 5th. James Barrett was elected to a two-year seat in 2011. He intends to run for re-election. Michelle Brownstein was first elected to the CHCCS Board in 2009. She is currently Board Chair. She also intends to run for re-election. Greg McElveen was appointed to fill Pam Hemminger's seat when Pam was elected to the Orange County Board of County Commissioners in 2008. He was elected to the seat in 2009. Greg will not be seeking re-election. This leaves one seat open. There are no known challengers at this point. Last month the Chapel Hill-Carrboro School Board decided on the new school districts that will go into effect as we open our eleventh elementary school this fall. I was always aware that these school reassignment discussions were contentious, but now that my son will be starting kindergarten in 2014, I'm trying to learn a lot more about how our coveted educational sausage is made. Since my neighborhood was assigned to the walk zone of the brand-new Northside Elementary, I was able to wade deeper into the mucky reassignment debate without having much personal investment in the outcome. I think the board did the right thing in choosing the plan that did the best job of distributing racial and economic diversity. But the process is inherently impossible. There is simply no way to put everyone in the school they want without inconveniencing someone else. 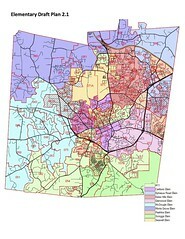 In this post I attempt to briefly summarize how the whole 2012-2013 redistricting went down.